Beyond the Dark now available in ebook format! Permuted Press has released the final chapter in the Dark trilogy, Beyond The Dark, in ebook format. Soon to be followed by audio book and paper formats, this completes the updated and revised version of the trilogy, with Dark Stories included-two of which even those folks who read all the Dark Stories I had to share in the previous electronic version have missed out on. One of which is a story told in first person, called “A Soldier’s Lament” which is tied into the world of Jeff and company-with a couple of characters from the books showing up. This particular story, which also appears in “Eyewitness Zombie” from May December Publications, an anthology of first person accounts of the apocalypse, is a bit different, and is definitely one I’m proud to have in this tome. The other story was written specifically for this book, and tells the back story of Lydia, one of the key secondary characters introduced in Into The Dark. In many ways, it is my favorite, because Lydia is a character who has grown to mean more to me in the past couple of years-she has elements of my late mother and sister in her, and she is a strong character who I love dearly. So please, check it out, and stay tuned for further updates for the paperback and audio formats of the book, coming soon. 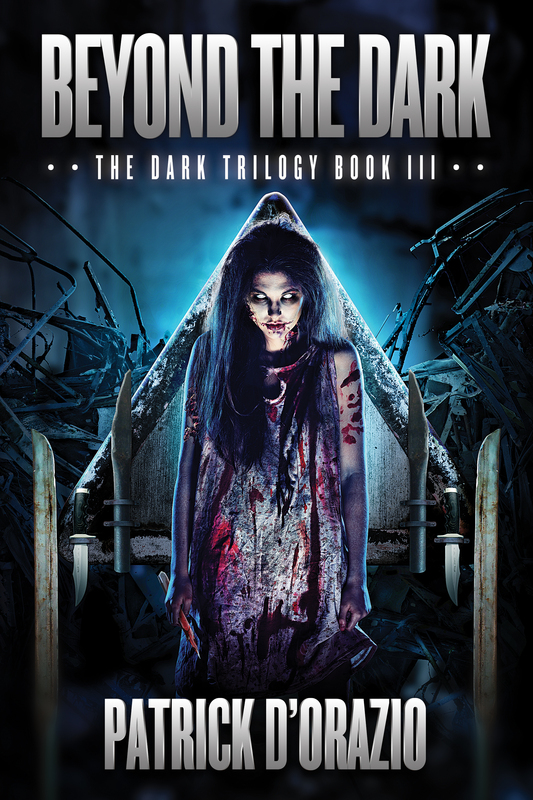 The 3rd and final book in Patrick D’Orazio‘s Dark Trilogy, BEYOND THE DARK, is out now in eBook! This entry was posted on April 18, 2013 by patrickdorazio. It was filed under Beyond The Dark, Dark Stories and was tagged with adventure, Apocalypse, beyond the dark, cover art, dark stories, horror, kindle, nook, Permuted Press, smashwords, zombies.